Excel spreadsheets are a cheap way of running a service business - but they don't scale well. Get to a certain size, start to share the files with multiple users and they don't work so well - but they aren't all bad. They are linear and in list format - so you they show you whwn and in what order the enquiry was taken. And that is why we have kept the look and style of an excel spreasheet in the enquiry database. But of course, with the added benefit of having it easily accessible to multiple users, easily searchable with the ability to provide statistics, data and reports. In this respect Flobot is unique. It is very easy to lose your enquiries once you have taken them and before you have decided to do with them and that is why we keep them in a handy list. And in a larger call centre that list can tell you who made the lst not and when and who is taking the most enquiries - and who isn't. You can also auto-allocate enquiries to call-centre handlers using Flobot. Lots of information about the customer can be captured at the enquiry stage. Useful details that determine what to do at the next stage - that might mean dong nothing at all becasu ou can't help them. 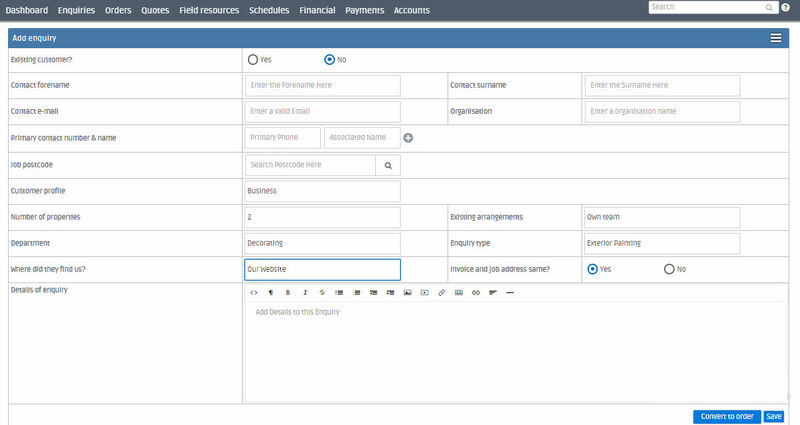 Adding an enquiry is as simple as clicking an option from the drop down menu. And on the enquiry list ordering the enquiries is as simple as clicking a heading. See just how the enquiries are being handled by your call cntre team. How long each team member is taking, who are the most and least successful - these are important things to know in any field service business. You can take as much or as little information into a customer enquiry - but Flobot won't let you convert it until you have the correct contact information to make an order relevant. There is never any reason to have a database full of juk - with no names, telephone numbers, email addresses etc and users often need saving from themselves. What the flash enquiry allows ou to do is take an enquiry from a potential client at speed. This is important when time is limited and it stops some users from writing thigs down on a notepad and then re-typing it - this is known to happen in less flexile workflow systems.